Bury’s Stray Cat Fund is set in the heart of the beautiful Suffolk countryside near historic Bury St. Edmunds. We are an independent cat sanctuary who have been looking after cats and kittens for over 40 years. Please see our History page to find out more about our story. 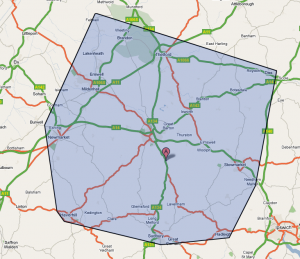 We operate within a strict radius set by our Committee – please take a look at the map to see if you are within our area. Unfortunately we are not able to home, or take in, cats, outside of this area. Please note that we only home to permanent UK residents. Bury’s Stray Cat Fund help felines of all ages and from all backgrounds including domestic and feral and we are very proud of our work which has led to tremendous success in caring for and re-homing many cats over the years. We also operate a foster scheme for older cats meaning that older cats who might otherwise be overlooked are able to live happy lives in new homes. As a charity relying solely on donations we are very thankful for the support we receive whether it be donations of money, goods or food; attendance at sales; or time to volunteer. We have detailed ways you can help us on this website.